why did nt she just export from yahoo to excel ? After 10 mins research I discovered there was no easy way it seems of doing this.. I came across an article on Apple Support Forums that lead me the right way.. Thanks to ‘Barney-15E’ if he still online as the article is dated back in 2010. Firstly I setup her Yahoo account on my mac mail as an iMap account. Downloaded all the messages she needed. You can fit the people that love applescript in a small car or even a bike.. Anyway thats about as much as I can tell you about applescript.. I now have the email stored in a mailbox inside my INBOX. set formula of range "D1" of theSheet to "Message"
set formula of range "C1" of theSheet to "Subject"
set formula of range "B1" of theSheet to "From"
set formula of range "A1" of theSheet to "Date"
Run the script and after a minute (depending on amount of messages) your excel sheet is complete. The first 9 lines open up Microsoft Excel and create a new worksheet..
they make theSheet the active sheet that is open. Then make the headings for A1-D1 on this worksheet. Next we open up the mail program. We set the row in the worksheet to row 2. We now get the account of theAccount and set theMessages to the messages in the INBOX. Now we setup a repeat until complete loop. To set each variable we call a function which puts that variable into the excel spreadsheet. Great information! I just have one question if you can answer, what if you want to extract specific data from the body of the email and extract to it’s own columns in Excel? If you have a solution for that, that would be greatly appreciated! I’ve been searching online but I cannot find a way to integrate any code into your applescript. (Keep in mind I’m not a programmer, and although I see so many saying applescript is easy, I only need this for a one time solution.) Also, I have a few thousand e-mails in this same configuration to extract to Excel, If you have a solution I’m sure it would benefit many people viewing this page! Thanks again! This was great! Worked perfectly for me! That works great for the inbox. Do you know how to do it for other mailboxes? In particular for locally saved mail folders under “on my mac”. Sorry, did nt get chance to answer your enquiry. But it looks like you have answered it for yourself. Was there anything different about the 85th message in that list, like maybe it was sent to multiple people or had an attachment. Im not going to profess to being a developer of applescript, in fact this was the first script I ever wrote with it. in the script to make it work. Looked at the 85th message. In fact repeated the script several days later, still stops at (presumably different) 85th message. Could it be that applescript is overloading the excel file? I had made one change to your script; I dropped Message and Subject when I ran it and got in trouble. Your full script runs fine, suggesting buffering issues. great script. 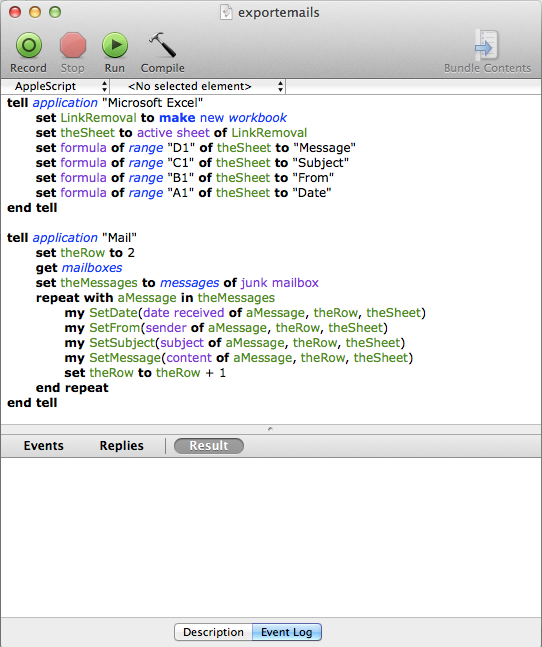 This is the first time I ever used Applescript. May I ask a (probably stupid) question: The content of the message is limited to 255 characters. Often the messages are longer. How can I ensure that the entire message is put into column D? Thanks for the script, it works perfectly…but I wonder how to get the info from a sub-folder- for example a folder stored “on my mac” called “leads”. I’ve messed around with a few ideas but can’t get that path right! You just saved me several hours of work. Much appreciated – especially the step by step explanation of how it worked. @ marc: it’s because the script tries to put the content as an excel formula and formulas max chars are 255. A positive sideeffect to this is that excel doesn’t need to parse “the formula” so you get a massive speed increase for you who have many mails. if you only want the script to parse one mail account. Thanks Palmeros for the response. As I state i’m definately no expert in Applescript. I just knew the script would help some people out. This script is great. I am trying to modify it by adding the “to field” as well, however, I have run into a problem when setting “recipient” as a column. Has anyone else used this script to export the to field as well? Is there a way to change this script so that it gets the recipients’ email address from sent mail? once you do that, you can swap “INBOX” to “Sent” and it works. THANK YOU FOR SHARING this is exactly what I needed! The script is great, however I added a timeout function since AppleScript times out after 2 mins. So I changed the variable to 30 mins to handle large inbox folder sizes. Enjoy ! Indeed a great experience and learning with this script. It worked perfect. Need some help if you can answer, what if you want to extract specific data from the body of the email and extract to it’s own columns in Excel? Thank you! This was extremely helpful! All I had to do was change “Sales” to “Exchange” and it did exactly what I needed. Has anyone succeeded in pulling the recipients in as well? Maybe if there’s a way to write “if unable to get recipient, return “””? A million thanks for this! It has saved me a lot of time and was easy to do. How would i collect email address’ from all my email message area only? I have about 400 emails to get emails out of the body area. Just wanted to say thank you verrrrrry much this just saved my keester. This reaffirms that the internet is the greatest thing ever. Years later and this post is still helping people! all should be well. Multiple recipients will be concatenated though. I leave that as a problem for the reader. Likely text manipulation in Excel itself is the way forward for that.